With another great bang and crash, Christchurch snaps another tendon and spasms in pain yet again. More historic buildings collapse – more demolition is due. Amazingly, yet again, there are no deaths from the latest one – especially seeing as there are numerous Engineers, Demolition crews, and Council officials roaming the streets down there. Christchurch lost at least one heritage building conservator in the big February earthquake, who was killed while working on some heritage restoration of buildings damaged in the September quake. 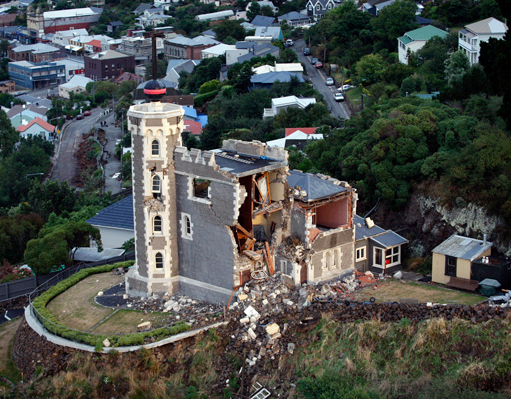 Most notably of course is the loss of the TimeBall station in Lyttleton – already built from unreinforced basalt rock masonry on an unstable hilltop, and badly / almost completely damaged in the big Feb Quake, apparently it has now completely disappeared in a puff of smoke. We were discussing this at the Fish the other day – one of us believed it could be saved, the other said it wasn’t worth saving. Apparently the Historic Places Trust were planning to dismantle it stone by stone, while suspended from a cage hung by a very large crane parked lower down the hill – seeing as those cranes costs thousands of dollars per day to hire, that wouldn’t have been a cheap option. Still: at least they don’t need to worry now. The demolition has been done for them. And remember the memories instead. You can’t bring something back from the dead – once it has gone, it has gone for good. As a piece of outdated technological history, it was still of a passing interest to curious tourists – but is it worth dying for? Nope. So here’s a nice picture from when it was relevant: remember this instead. 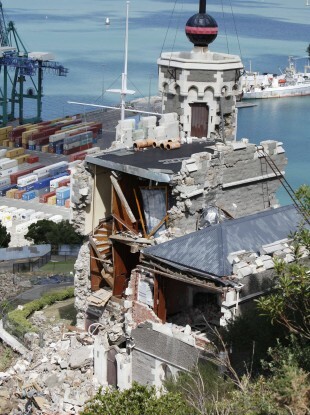 “Lyttelton’s historic Timeball Station tower collapsed during yesterday’s 2.20pm earthquake while contractors were working on the site. Work to dismantle the 1876 building, which was badly damaged in the September 4 quake and suffered more damage in February, began two weeks ago. Workmen from Smiths Cranes were elevated in a cage when the magnitude-5.5 quake hit yesterday, but were uninjured. New Zealand Historic Places Trust chief executive Bruce Chapman said while some of the building was still standing, the site was too dangerous to assess. It was too early to speculate on the building’s future, he said. “The absolute priority is ensuring public safety. Considerable care and attention had gone into the dismantling process to safeguard people as best as possible,” he said. Trust project manager Paul McGahan said the new damage was “`substantial”. “The mast and timeball is down the slope, near the gate at the front. There were two containers that did prevent material going forward and onto the road,” he said. Contractors and staff were safe, McGahan said. Its probably more economical cleaning up the mess than paying the extra time it would take to stack shelves with lips? Also as supermarkets are supposed to be all about convenience maybe a lip on the shelf is seen as being (marginally) counter convenient. It’s not just the Time Ball – I’m fairly incredulous at how much extra damage these latest tremors have done – the front of the Cathedral has caved in, more of the churches in Lyttleton have collapsed (are there even any left now? ), and yet again the liquefaction mud creeps higher up the piles of those on the East side. News reports keep on stating that some Cantabrians are moving away, although I’ve not seen any here in Wellington yet. They all seem to be going to Sydney or to Auckland, but no sign of increases in the capital. Are they really just scared off by the likelihood of our own tremors? Its a pity really as we could do with some more businesses opening in this city. It was fascinating (for me) to see the footage of the liquifaction coming up, that would get annoying damn quick. Three more years of this now they reckon? And still no information about which suburbs are to stay and which are to go? “Blindingly obvious” apparently, but they (Brownlee) can’t tell us (well them/cantabs). If they win any votes in Canterbury this election I’ll be bloody amazed. I know I’d be thinking if my house is in a suburb to be demo’d, and I could get some kind of payout on the former value of the land rather than any kind of swap for land on the western side, I’d probably take that money and leave. Three more years, heck no. Wondering: If there is going to be a lot of people thinking that they’ll move, and relocating, is there any sense at this point in the government trying to plan and direct that migration? For example, rather than just giving people a payout on the former value of their land, maybe the Government buys land in strategic spots (e.g. Hamilton) and gives the options for land swaps — or some of your money plus some land, with different ways of packaging incentives to disperse the migration however would be best. This would be better than having them all bugger off to Australia. erentz – i think the Gov is not intending for the people to exit the province altogether, but just to move from East to West. I’m not sure how much rivalry there is between East Canterbury vs West Canterbury (not many, if any, aunt Fanny, if we are to believe the once mighty Scribe), but from what I can understand in my (extremely limited) knowledge of Christchurch, the east has mostly poor people, in quake-damaged houses on liquefied soil, whereas the west has rich people, in houses that are fine, on ground that still hangs together. I’d therefore think that there may be a few issues in getting new suburbs built for poor white folk on the outskirts of existing leafy rich peoples suburbs. Issues abound in Christchurch, if we believe the hype, with the First Four Ships, and the rise of the neo-Nazi. Is that too simplistic, or is there any truth in it? I dunno. I guess that what is relevant as an example is the state of New Orleans now, with half the city now abandoned, and houses still standing half wrecked. Other cities that have been abandoned probably spent a bit more money in removing the wrecked houses (free firewood for years!) and ripping up the concrete, to leave the abandoned suburbs to become a Canterbury version of Chernoble, suitable only for massive multi-player paintball wars, or perhaps a giant BMX track.